There are actually many people involved but you can always talk directly to the owner, Jim Dow. There aren't any phoney voice mail directories or departments. Jim wants to talk to his customers and make sure they get personal service. What makes Optima Press different from other printers? There are actually many things, but at the top of the list is customer service and satisfaction. At Optima Press, one size does not fit all customers. It isn't about having the absolute cheapest way to make a product. Price is important but getting a quality product that meets expectations is equally important. Internet high volume printers don't want to talk to their customers because it cuts into their profit. They have one kind of paper and print with one kind of ink. That's not the Optima Press philosophy. There are 1,000s of paper types and Optima Press knows about them all. The type of paper can make an incredible difference in the look and feel of the finish printed product. Some services are actually free. Others might be considered expensive. 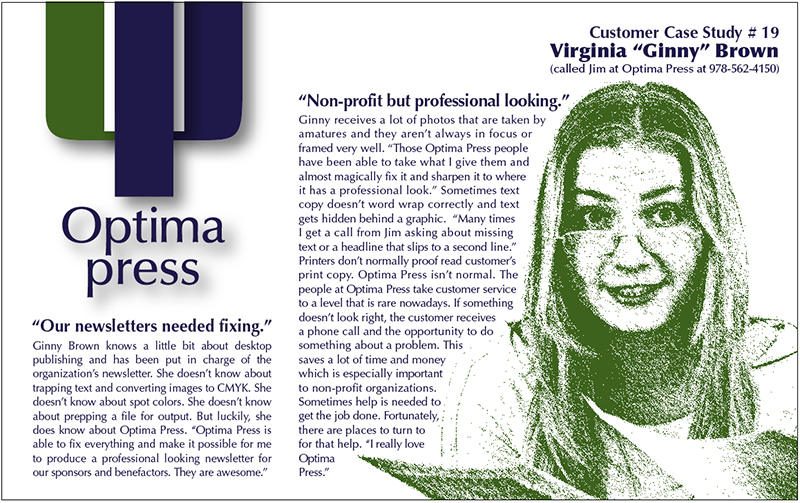 The bottom line is that Optima Press works with you to get the exact product you need at a fair price. When you get what you want and problems are solved you end up paying less for more. If it has to do with an image, Optima Press can help you achieve the results you are looking for. Optima Press even stocks glass frames for professional photography display. Call us to schedule an appointment by phone or in person if you are in the eastern Massachusetts area. How much does one color printing cost? How much does two color printing cost? How much does three color printing cost? How much does four color printing cost? How much does five color printing cost? How much does six color printing cost? How much does seven color printing cost? How much does eight color printing cost? How much does folding cost? How much does... You get the idea! Optima Press will get you the best answers for all of your printing needs.